Living in the present moment takes a lot of discipline. To never think about the past? The parts we can’t seem to let go of: our remorse, guilt over things we can’t undo now? We have happy memories, too, but the bad ones often pop up like weeds. And never look ahead to tomorrow? We have hopes and dreams, fantasies. Sometimes our fears push us to project in negative ways. And that’s just wasteful, though I always rationalize that it’s preparing myself for the worst. But placing all of my attention on what’s happening right now, without distracting myself with other times, gives me a chance to maximize each moment I’m experiencing. Time is a valuable commodity, and I want to make the most of mine. Watching my daughter and all other addicts lose themselves in the hellish world of addiction has been a powerful object lesson for me. I’m learning to appreciate the gifts of time and appreciate what’s right in front of me. 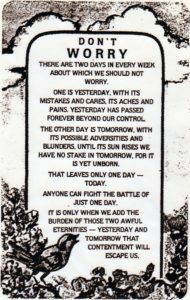 “Just for today,” I will do the best I can with what I’ve got.